It's hard to keep up with all the Kickstarter projects for bicycle lights, but this one caught my eye. I am surprised by the great diversity of the ideas, which really shows again that there is no such thing as the "ultimate bicycle light", as it is different for everybody. This time we have the VeloCityLight, made by some people from the United Kingdom. 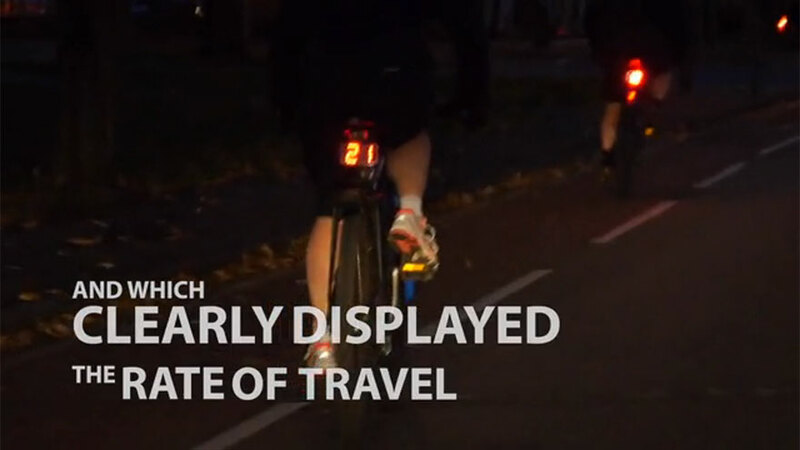 It's a rear bicycle light that shows the current speed of the bicycle to traffic coming from behind. It is obvious that this light is intended for situations where bicycles share the road with cars and there is a big difference in speed between the two vehicles. And of course you can also show off your speed to your cycling buddies. The Kickstarter project also ships outside the United Kingdom, however the speed is displayed in miles per hour. There is no mention of it being able to do kilometers too. I hope it does, otherwise it would be completely useless outside the United Kingdom, United States, Liberia and Myanmar. Again, just as we have seen with the Xlerad the makers make some bold claims regarding enhanced safety, yet fail to back this up. There is absolutely no indication anywhere that they had somebody test the fact if their product really makes things safer. It seems like they have been riding around with it themselves and taken the fact that they didn't get hit by a car while doing it as proof for its superior safety. All the pictures and video show the light being used on bicycles that are not even street legal in the United Kingdom. The racing bicycles lack any reflectors, and the commuting bicycle shown only has reflectors on the pedals. The light also lacks any retroreflectors, which greatly improve visibility and are a legal requirement, even in the United Kingdom. A screenshot from the product video shows the light in action. Notice that the only reflectors on the bicycle are in the pedals and on the shoes, and how bright they look. The bicycles lack the other required reflectors in the back, and wheels. It does not appear to have any light or reflectors in front either. Is it obvious to drivers that a number is being displayed? Is it clear that this number is the current speed of the bicycle? Do people really think about those when they see a red glowing "12"? According to the makers it "fundamentally affects the way drivers think as they approach". Lets for a moment suppose that this claim is true (even though it is most likely not true), there is still no evidence that it influences the chances of an accident in any meaningful way. It is admirable that people try to improve safety, but this is not the way to go. It is clear that in the United Kingdom cycling can be very dangerous and it's alluring to think that a little gadget like a bicycle light can make all the problems go away. Unfortunately that is not the case. What is needed is changes to the infrastructure and legislation. This will take time, in the mean time people will die, and these lights do not prevent this in any way. I wish they did, but there is zero evidence that they do. However it's a nice way to show off your speed to your cycling buddies.